KYRENAICA, Kyrene, (322-308 B.C. 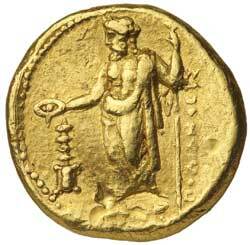 ), gold stater, (8.59 g), obv. 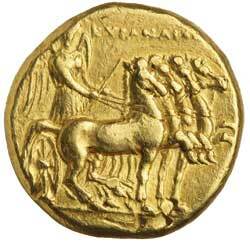 slow quadriga driven by Nike, three quarter face to r., KYPANAIO[N] above, rev. Zeus Ammon standing facing head to left, sacrificing from phiale over thymiaterion and holding lotus-headed sceptre, on r., **POLIANQEUS*, (S.6301, BMC 120 (p.30), Fr.553, SNG Cop.1210 [Pl.XXIX). Knock in field on reverse, very fine and very rare. Ex Noble Numismatics Sale 69 (lot 1690).